Offering great versatility and reliability, modular machine enclosures serve to protect expensive and sensitive equipment from environmental factors such as noise, temperature, humidity, and particulates. By isolating their machines, companies can greatly reduce their rejection rate of their output while providing a consistent, safe environment for equipment, reducing the maintenance costs typically incurred in dirty or disorganized machine shops. In addition to serving as pump houses, modular machine enclosures also are used to safeguard printing machines, automated machinery, coordinate measuring machines (CMMs), computer numerical control (CNC) tools, electrical discharge machinery (EDM), and radio-frequency identification (RFID) equipment. These versatile modular units may also serve as laser rooms. Modular machine enclosures offer a range of unique benefits. First off, these units are highly customizable, meaning they can be constructed to manufacturers’ exact specifications. Next, modular structures eliminate the need for costly, time-consuming renovations. And thanks to the great flexibility offered by modular construction, if a space needs to be renovated, relocated, or resized, the enclosure can be easily reconfigured, rather than having to invest in a completely new structure. Modular machine enclosures are also very cost-effective. Not only are they cheaper than new buildings or costly facility renovations, they also protect against unnecessary downtime that can take away from a company’s bottom line. Plus, as mentioned earlier, these structures can help reduce manufacturers’ output rejection rates while cutting maintenance costs. These prefabricated buildings can be delivered and installed quickly and inexpensively, minimizing facility disruptions. And finally, modular structures allow for better air quality, as they are typically built in factory-controlled settings using dry materials, eliminating the possibility of high levels of moisture in the new construction. Standard machine enclosures include a 26- or 29-gauge exterior steel frame with forklift pockets for easy transportation, a complete floor with galvanized supports, reinforced walls, and complete lighting and electrical systems. Other material options include bulletproof steel, concrete, fiberglass, aluminum, concrete, and wood. Exterior finish options include aluminum, fiberglass-reinforced plastic, painted steel, PVC, and vinyl. 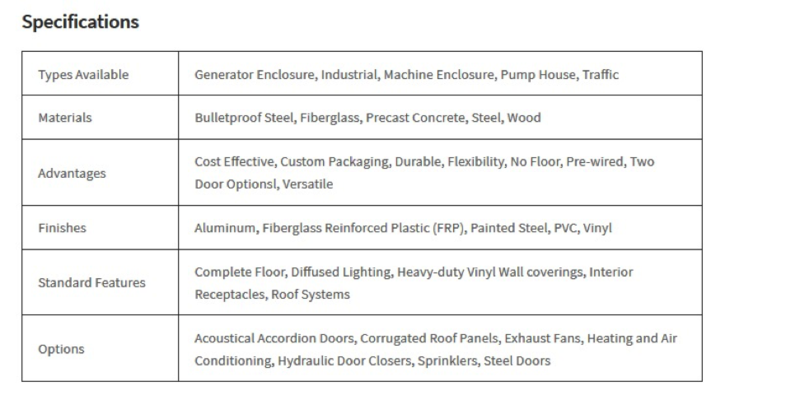 Various special features can be added as well, such as heating and air conditioning units, corrugated roofs, stackable roofs, angled walls, sprinklers, ventilation, exhaust fans, automatic door closures and security systems, and a number of door and window options. Optional features are also offered; galvanized roofs can provide extra protection against the elements, preventing the development of rust and corrosion. Similarly, in areas where protection from harsh weather is essential, enclosure floors can be made with extra-galvanized sheeting, and glass windows can be double-insulated, allowing for reliable temperature control and preventing moisture damage. Humidity is further contained by vapor barriers throughout the enclosure, and a generous 3.5 inches of insulation is included in all structures to regulate inside temperature. The standard steel walls allow for inherent sound control, offering a 25-30 decibel reduction from outside volume. Additional sound-deadening materials are available as well. Other add-ons include baseboard heating systems, conduits for computer wiring, bathrooms, tinted or reflective windows, carpeting or vinyl floorings, storage compartments, smoke and carbon monoxide alarms, and security windows. All of Speed Space’s modular machine enclosures are prewired and ready for use upon installation. Key specifications are listed below. With more than three decades of experience designing and installing modular buildings for a range of applications and industries, Speed Space is proud to provide customized modular machine enclosures, enhancing facility efficiency, safety, and savings. Request a quote today to learn more and discuss your options with an expert.